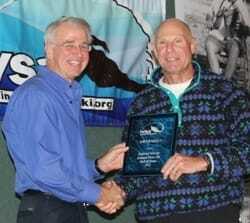 John Kniesly is pictured here accepting the award from presenter Bill Roach. John has been involved with Indiana water skiing since his early child hood days, where he knew and heard about tournaments but in the day didn't know how to get a hold of the people involved to find out more about it, till one year the state tournament came to him, Just a short drive to the lake where he spent their summers. After his first state tournament experience he was off to find a jump ramp to buy. He and his friends stuffed mail boxes for donations around the lake and before he knew it they as just kids had enough money to buy a jump that the Spray Riders from South Bend area that they were selling. They had a blast with that ramp and the rest is history. John has held over the years numerous state water ski records. He was a finalist at numerous regionals and nationals. 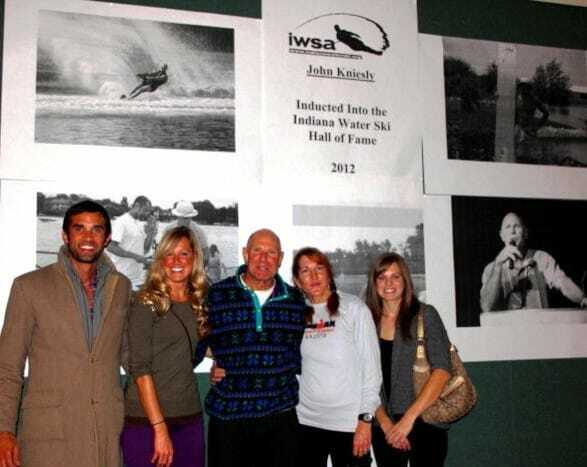 John, has held many positions on the IWSA Board of Directors for numerous years and has been a past board president. john found an interest in Disabled skiing years ago and was the Founder of the RHI Disabled water ski clinics at morse Reservoir which are still going strong after 17 years with record turn outs over a three day event. He is also a two time Disabled National Tournament Co-Chair and Organizer and Chief Announcer. He was the team manager of the Disabled National team in Australia. He is a Level 3 water Ski instructor, has spent many hours giving instruction at Monday Night Ski Leagues at the Fairland Ski Club as well as the White River on Thursday nights. He was the founder of the Indy Ski Club in Shelbyville and founder of the Indy Skiers who still enjoys the public facility on the White River in Indianapolis. John holds a state Safety Director Rating, and has been the Chief Writer for the IWSA newsletter for many years, since it's inception.